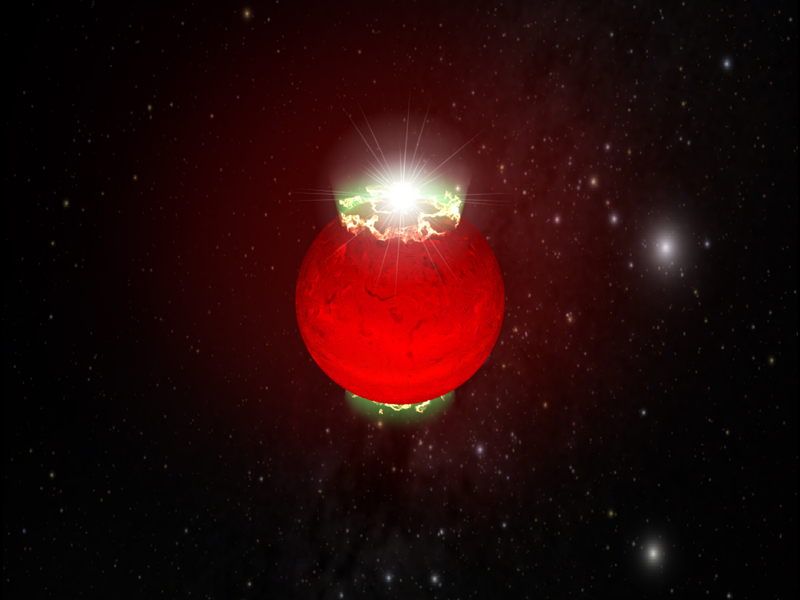 Artist's impression of the "super-aurorae" present at the magnetic poles of these brown dwarfs where the extremely bright beams of radiation originate. These beams of sweep Earth once each time the dwarf rotates, producing the periodic pulses. Two images of the location of the binary L dwarf 2MASSW J0746425+2000321 taken with the VLA at a frequency of 4.88 GHz. The position of the binary brown dwarf is marked by a white arrow in both cases. A field source is located 10 arcseconds from the brown dwarf and is present in both images to the upper left hand side of the target. 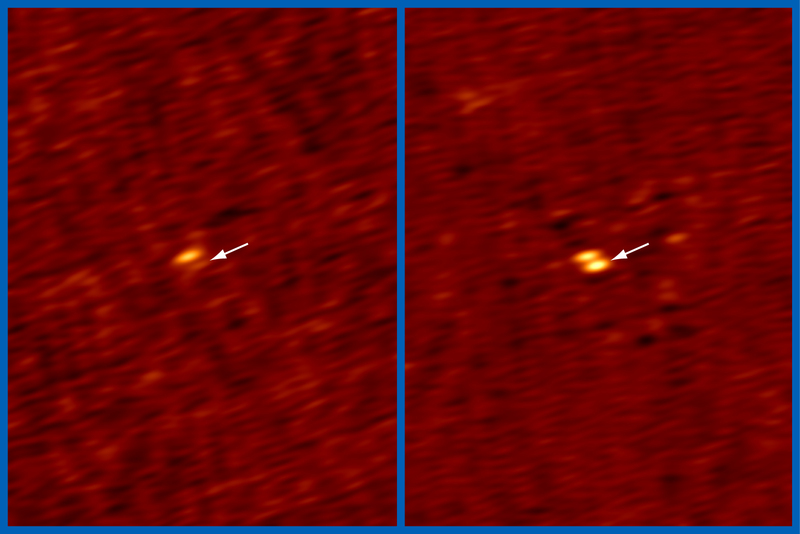 The left hand image was taken during the interpulse phase, when the binary brown dwarf is too faint to be detected. The right hand image was taken during one of the pulses with the brown dwarf now outshining the nearby field source. 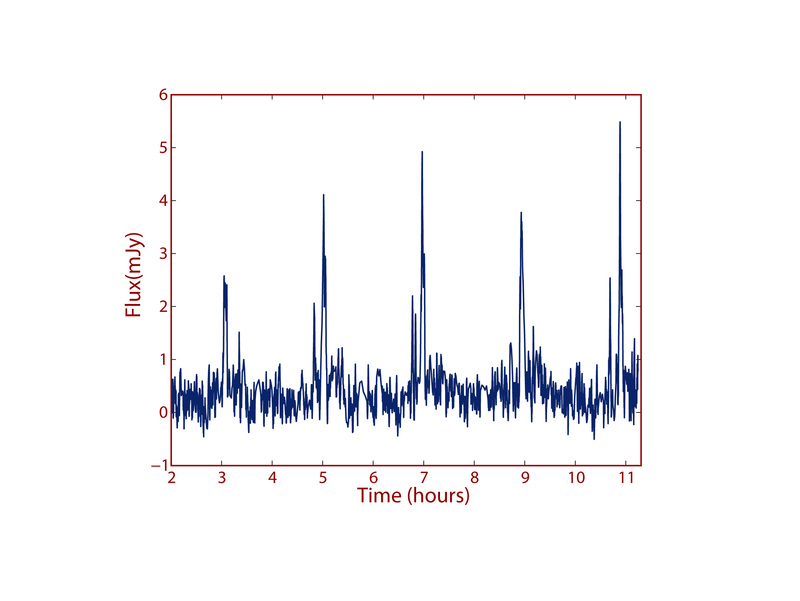 Time series of the radio emission detected with the VLA from the M9 dwarf TVLM 513-46546. Every 1.958 hours a periodic pulse is detected when extremely bright beams of radiation originating at the poles sweep Earth when the dwarf rotates. This dim dwarf is producing radio emission which is thousands of times brighter than any ever detected from the Sun. Animated gif of the radio emission from the M9 dwarf TVLM 513-46546 detected with the VLA at 8.44 GHz . 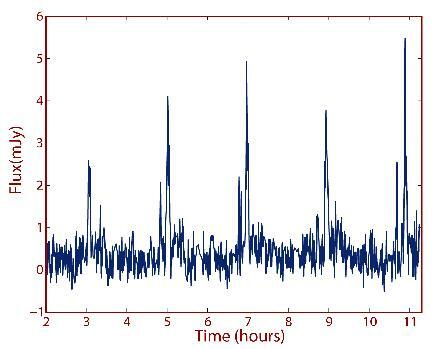 The time between each bright pulse corresponds to 1.958 hours, which is the period of rotation of the dwarf.